Just across the yard from the main house is Skellig Bay View Cottage. This is ideal for the grandparents to stay in so they can have a bit of space away from the hustle and bustle of the main house. It would also be ideal for a family with young children who need some quiet time. There are two bedrooms - one downstairs and with access to the guest toilet, and the other upstairs with a lovely spacious bathroom and a separate dressing room area. Downstairs, the sitting room and living room areas offer incredible sea views. Patio doors lead out to a separate large patio area with a full set of great quality and very comfortable Jamie Oliver garden furniture overlooking the football pitch sized garden! There is plenty of off-road parking in the yard and alongside the house. A large patio area leads from the main house and also has a great Jamie Oliver garden furniture set. 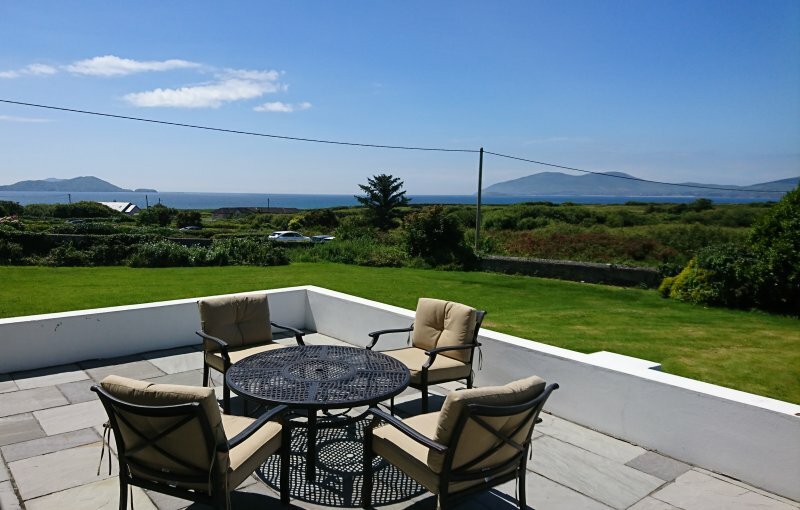 The views towards the sea are just magnificent and you are sure to create many happy family memories from your stay at Skellig Bay View House. There are about eight sandy beaches within a 20 minute drive of the house. You can walk to the Golf Links Beach. Walking into Waterville itself will take you about 10-15 minutes. Electricity is an extra charge and is payable in advance of your stay to Dream Ireland. It is charged at the rate of €5 per day for June, July and August and €7 per day for all other months of the year.